For my Growing in Unity Day 2, I am using the sentiment kit Succulent Salutations . This is a fabulous kit that includes 18 stamps. I am not a gardener so this set is as close as I will be getting to having a plant. I love to fussy cut and paper-piece - this card is perfect for that.
" just take it one day at a time "
I started with a Molly & Rex card base, A pink doily was placed in the upper left corner of the card and trimmed to fit. The succulents, sentiment and bird were stamped with Memories Black India ink - I stamped the succulents several times on both Neenah Stardust White cardstock and patterned paper . The patterned paper was from 2 Prima pads - Hello Pastel and Life Time. I fussy cut the planters and 2 of the succulents, then adhered them to the image stamped on the cardstock. Distress Markers were used to color several sections of the succulents. The sentiment was paper-punched then stapled to another paper-punched square of patterned paper. A strip of glitter washi was placed along the bottom of the succulent image, then this mage was adhered to the bottom right corner of the card. A fussy cut bird was adhered to the top of the sentiment. Please comment on this post. I will randomly choose 2 winners to win 25 Unity stamps at the end of my GIU week. Thank you for taking the time to visit Meticulosity. Very cute. I like the paper piecing and the strip of glittery washi tape. Love all the gorgeous details!!! Succulents are really pretty!!! Oh, you and I grow the same kind of plants. Very cute card. I like your choice of paper and bits you used on this card. They go so well together. Thanks! Such a bright and cheerful way to brighten someone's day! I love the combination of elements and colors. Great paper piecing! Love the paper piecing! Delightful card! Love those sweet little cacti girl! Too cute! Love the doily in the corner. A nice touch and different. A very sweet card! Love all your coordinating paper! Sweet card. I think it is my kind of garden too, but I' ve been known to kill cactus also. Lol Thanks for sharing. So much attention to detail. Beautifully done. The distress markers on your succulents are the perfect colors!! I just got me some yesterday at a local craft store that is going out of business, so sad. but happy to the markers for 60% off. Your card is adorable. Succulents are all the rage. Your cards are just gorgeous. lovely colors. Terrific card...like the paper piecing. Love the paper piecing on the cactus and that sweet little birdie! I too enjoy fussy cutting and agree with you on gardening. Nicely done card. Thanks for sharing! Such fun cards and I love to see paper piecing. Lol not sure what happen but here goes. Lol I'm not great at gardening either so paper planting is fine with me. Great paper piecing and love the doily. I tend to use them a lot myself. Cute card! I think I might kill succulents too! cute card! Love how you paper pieced it. I like the sentiment on vellum and the doily behind it. Love this one, so beautiful!! Love the patterns, the pastels, and the succulents! Very fun card. The succulents are adorable. Nice job. Fantastic paper pieced cuts! This card is beautiful! Congrats on your GIU week! Cute card. I'm not much of a gardener either, but I do have a cactus I haven't killed yet. Lol. Love this stamp. I think I'll add it to my wish list would make a great house warming tag for a plant gift. This Stamp set is so cute- I have it too! Love the idea of paper piecing the planters. Very seeet card! Not sure how succulents became so popular, but I'm obsessed with them! I haven't purchased a succulent/cacti stamp set yet, but I think this one might be it! Thanks for sharing this adorable card! So cute. I love fussy cutting...must be crazy! This card is so FUN! Succulents are so beautiful, lovely project! Love the 3D effect on the card!! And the different layering! The background gives a southwest vibe. Love that and the plaid accents paper pieced in. Adorable I love your layering if embellishments and the colors you chose. 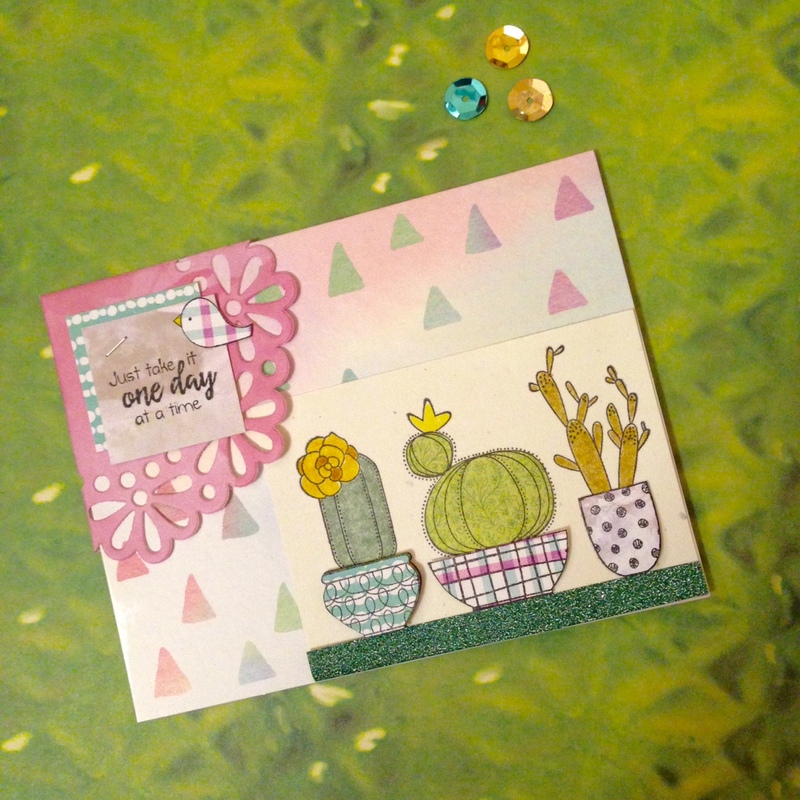 Your card is a fun way to use this stamp set! Love the colors!